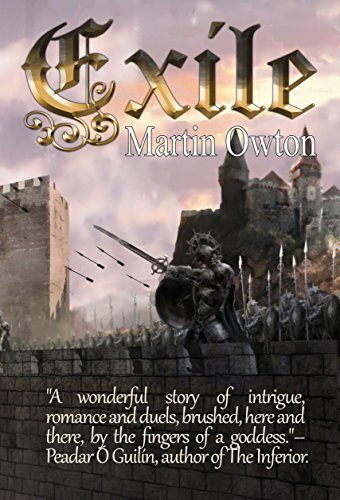 ‘Exile’ is a fast-moving tightly-plotted fantasy adventure story with a strong thread of romance. Aron of Darien, raised in exile after his homeland is conquered by a treacherous warlord, makes his way in the world on the strength of his wits and skill with a sword. Both are sorely tested when he is impressed into the service of the Earl of Nandor to rescue his heir from captivity in the fortress of Sarazan. The rescue goes awry. Aron and his companions are betrayed and must flee for their lives. Pursued by steel and magic, they find new friends and old enemies on the road that leads, after many turns, to the city of the High King. There Aron must face his father’s murderer before risking everything in a fight to the death with the deadliest swordsman in the kingdom. This is a real gem of a fantasy story, action packed, a little bit of love, a fair sprinkling of magic and characters names that I can actually pronounce and remember! When Aron fights and kills the Earl’s swordmaster, in a local bar, his punishment is to take the swordmaster’s place and train the men. Aron has real talent for fighting with a sword, far superior to the haphazard, fighting ways of the rabble he is given. The Earl strikes a deal with him. Go out on a rescue mission and return with his heir to the throne, who is being kept prisoner and he will release Aron from his service. Now there has been a little flirting going on with the Earl’s two daughters and a lot more than flirting with the Earl’s wife which makes for some light entertainment. They are characters that play major roles throughout the book. The fight scenes are superb, realistically brutal in Technicolor detail that played out in my mind. Every stroke with a purpose, the techniques, planning and adjustments made for each unique coupling of their opponents. The further Aron and the Earls men travel together the more they gel. There aren’t any second chances you win or die. There is superstition that keep people in line and for those that dare there is magic to help the mission. The magic I loved but it had its warnings for those that ventured into it. Unlikely alliances and promises that mustn’t be broken were made and I felt really like ‘do you want to do this?’ The second half of the book is way beyond entertaining. Oh wow talk about build up, each page just took me further from tense to dread. I hated what was happening and yet there was no way I could stop reading. It is top class with each page dripping in magic. I loved how the Earl’s daughters roles grew in the story, very gutsy ladies. As for Aron well I believe there is to be a second book. If his adventures are anything like this then it is a must read. This is all round entertainment with characters that mature and become real feel people. This really is an outstanding read. If you haven’t read any fantasy type stories before then read this. 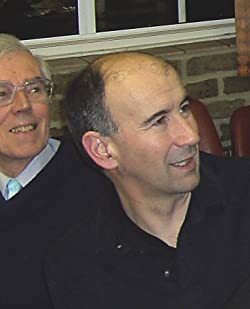 Martin Owton Write a lot, read a lot, critique a lot, seek out other writers and listen to their advice. Don’t quit; it’s a marathon not a sprint.